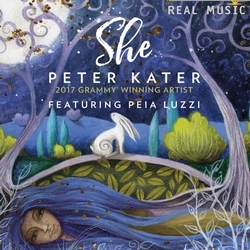 Grammy Award winning and twelve-time Grammy nominated Pianist/Composer Peter Kater presents She, an evocative and impassioned new recording featuring archival songstress Peia Luzzi. She resounds from within the profound sanctity of life, from the depths of our innermost vulnerabilities and to the heights of our most ecstatic rejoicings. On She, Peter and Peia celebrate in joyous music, wordless harmony, the sounds of nature and the divine feminine in all her earthy sensuality and celestial mystery. We are happy to share its in preview on Radio PLENITUDE, every day, from March 14, 2018 until April 10, 2018 inclusive before it enters a regular program.